Ko Lanta dive sites offer coral-covered pinnacles, deep drop offs, fringing reefs, caves and tunnels, wrecks and much more. Andaman Sea, our sites include the fabled Hin Daeng and Hin Muang, the nearby Ko Ha, and the perrenial favorites of Hin Bida, Fantasea Rock, Ko Bida, Ko Rok, Ko Muk and the King Cruiser wreck. Despite the range of excellent sites, many divers come for Hin Daeng and Hin Mouang as they are often rated among the best dive sites in the world. Their impressive underwater landscape and fantastic marine life including reef sharks, manta rays and whale sharks offers truly spectacular diving. When approaching Hin Daeng all one sees are 3 small rocks just breaking the surface. But under the surface lies a dramatic underwater landscape. Drop offs with walls dropping over 50 meters and exhilarating corridors covered by hard and soft corals. This is a dive site you don’t dive the same way twice. Back and forth, in and out, somehow it feels as if there are always new parts of the reef waiting to be explored. Only a small distance away lies Hin Muang, one of the most beautiful submerged reefs in the the world. This rock features the deepest drop off in Thailand, exceeding 70 meters. It is covered, completely covered with anemones and absolutely stunning purple soft corals. It offers the same variety of marine life as Hin Daeng, with huge schools of Rainbow Runners, big Tunas, and great Barracudas. Hin Muang and Hin Daeng are considered the best places in Thailand to spot the gentle giants of the ocean, Whale Sharks. But don’t neglect Ko Lanta's other top of the line dive sites. 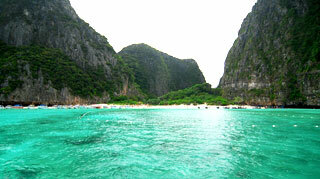 Ko Ha with its great wall dives and exciting caves offers excellent memories. For some reason it almost always offers extraordinary dive conditions, with visibility normally exceeding 20 meters. At Ko Bida Nok, Fantasy Rock and Hin Bida we see the same variety of hard and soft coral and abundant marine life as at Ko Ha, plus our "Leopard Shark guarantee" (well, almost guaranteed). These friendly, beautiful sharks never seem to tire of taking a closer look at us and our visiting divers.